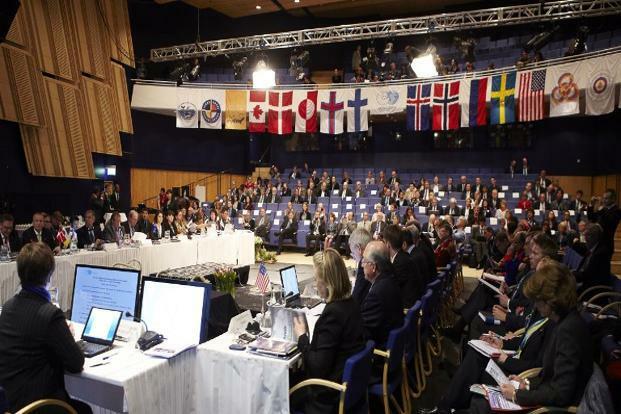 In the spring of 2015, the United States assumed chairmanship of the Arctic Council for a two-year term. The chair was handed over by Canada, who in turn had assumed it from the Swedish chairmanship in 2013. Canada’s chairmanship had been quite different from that of its Swedish predecessor, focusing its efforts less on environmental issues and more on economic development. This was especially true from the perspective of securing greater potential investment and corporate interest in the circumpolar North. This was also an important and overdue emphasis aided in part, no doubt, by the specific interests of Canada’s senior Arctic officials. As such, the most enduring result of the Canadian chairmanship became a new Arctic Council initiative: the establishment of an Arctic Economic Council (AEC). Though it carries the legacy of carrying distinctly Canadian origins, the AEC built upon an earlier agreement to create a circumpolar business forum brokered with the Arctic states in 2013. The creation of the AEC in turn triggered a flurry of interest in developing larger supporting initiatives for Arctic economic development from a corporate and business perspective. These included spin-off forums such as the now annual Arctic Circle meetings in Reykjavik, Iceland, Canada’s recent Arctic Age/City Age forum on northern business, and a host of other workshops and colloquiums on Arctic development projects. The result was a rather new perspective on the relationship between Arctic communities and business interests. One important point was that it essentially marked the recognition of the role of private corporate actors in the work of northern policy and affairs. To date, the corporate and private sector have not played a significant role in the Arctic Council, a forum dominated by national governments, public sector actors, NGOs, and indigenous peoples’ organizations. Perhaps this is why the Arctic Economic Council was constructed to be a linked and quasi-independent initiative, rather than a working group of the Arctic Council. Yet if there is any question about the importance of the private and corporate sector in this Canadian-led Council, the AEC’s website boasts the image of a presumably fully-loaded transport truck hauling cargo across the snowy roads of an unspecified remote circumpolar location, presumably Yukon or Alaska. While many in retrospect regard the Canadian agenda as quite significant, its introduction endured lukewarm reception at first. Many initial critics believed that the economic agenda reflected a narrow Canadian focus on resource development and domestic agendas. In the spring of 2014, for example, some Arctic watchers believed that because of the appointment of retired Admiral Papp as a special representative to the U.S. Arctic Council Chairmanship Committee, the U.S. was suggesting that it would take a very different approach from Canada. Disappointment with the Canadian chairmanship’s economic agenda by some contributed to the feeling it would be “corrected” as the U.S. moved from a focus on economic development and toward a soft security and international relations orientation. The Arctic Institute suggested in July 2014, for example, that “unlike Canada, the U.S. is placing less emphasis on economic development and is focusing more on maritime issues, security, and shipping.” It also speculated that the U.S. would ensure that environmental protection and science did not take a back seat in Council deliberations. Once the U.S. assumed the chairmanship, however, attitudes had changed. By the end of the Canadian chairmanship, there was a more general consensus that the Arctic Economic Council was an important step forward. Indeed, Finland’s senior Arctic official, Aleksi Härkönen, referred to it as the “missing piece” of the Arctic Council agenda. Through its business representatives, the AEC would strengthen the Arctic Council by enhancing economic cooperation; better informing, fostering, and facilitating opportunities for local economic development; and advancing sustainable development of the Arctic through business models which promoted the best practices. More broadly, the Economic Council would contribute to a stable, predictable, and transparent business climate; facilitate trade and investment in the Arctic; and maximize the potential for Arctic economic activities to take into account environmental protection and a positive impact on the communities of Arctic indigenous peoples. Also by the time Canada handed over the reins to the U.S. in April, the Iqaluit Declaration was signed by the Arctic Council, providing a mandate for the U.S. chairmanship more focused on the environment, sustainable development, and the protection of indigenous populations. Yet rather than take the chairmanship in a different direction than that of their Canadian predecessors, it seems that the U.S. is stressing continuity. Rather than a focus upon security and environment to the exclusion of other interests, the three pillars of the U.S. chairmanship were more inclusive of economic development. In keeping with the Iqaluit Declaration to which the Arctic Council members states had all signed, the remaining areas in which the U.S. chair planned to focus its efforts are accordingly identified by the U.S. Arctic Chair Committee as safety, security, and stewardship in the Arctic Ocean, along with addressing the impacts of climate change. Still, despite the fact that the U.S. chair has placed a strong emphasis on improving economic and living conditions in the circumpolar North (as did Canada), there are some appreciable differences in their respective approaches to what some would describe as “economic.” Rather than stress a corporate agenda, its intent is to couple economic development with initiatives to better develop local community capacity to cope with the challenges of changing economies, environments, and technologies. Once such program, the circumpolar assessment of telecommunications infrastructure, supports an initiative which has already been several years in the making. Long overdue, the task force struck by the U.S. chair on this issue targets the problem of uneven and expensive access to telecommunications which plague many northern communities. Differences exist in the degree to which climate change and Arctic science have been emphasized — two subject areas where the Canadian government was seen to have fallen short. Further, the emphasis on “communities” has gained legibility and credibility over the past two years. Along with initiatives for the strengthening of traditional knowledge and community development, these seem to be key legacies upon which a consensus can be reached. Of course there are other important programs which the U.S. chair is developing, and we should expect to see a renewed focus on environmental concerns, maritime safety, shipping, and the very urgent challenges of climate change. Changing chairmanships for the Arctic Council will translate into differences in agendas, priorities, and programs, which is to be expected. But in the long run, the choppy waters which seemingly characterized the beginning of the current North American chairmanship cycle in 2013 have translated into a coherent and definable North American program, resulting in some significant achievements. Overall, we see a continuing focus on northern communities and much needed programs and tools for their well-being, which may well last beyond the end of the U.S. chair in 2015. Time will tell, but at this stage it is clear that the U.S. chairmanship has not abandoned the course set by Canada. To the contrary, it has refined and built upon it. Heather Nicol is a political geographer specializing in the circumpolar North and Canada-Cuba relations.